Olympic Speed skating. As fast as a human can move on ice, on skates. Olympic speed skating may be a fairly new competition but skating has been around for a very long time. Anyone who has ever visited Holland can’t help not to notice that canals play a huge part of the everyday life of the people. Of course they freeze up in winter. Once frozen, people are able to walk to get to where they want to go. Many years ago, around 1850 or so ice skates were being used in Scandinavia. Here is a photo of a pair of antique skatesfrom that era. This pair of skates is from a wonderfully detailed collection in Markham, Ontario. Skates from Canada, United states, Holland, Germany, Switzerland are shown. As is bound to happen, skating competition evolved and soon became an extremely popular sport. In the 1924 Olympics skating was begun for the first time. Olympic speed skating has been part of the winter olympics ever since. Only men competed at that time. The women’s skating got its start at Squaw Valley in 1964. There are normally ten events for competition, over varying distances. Individual as well as team pursuit. All of the distances are skated only once but the 500 meters is different as the racers skate two heats. The final result is the combined time of both heats. During each event the racers skate counter-clockwise around a 400 meter oval. The skaters start side by side. The inside skater wears a red armband and the one on the outside wears a white one. The skaters change lanes after each lap with the skater passing from the outside it inside having the right of way. 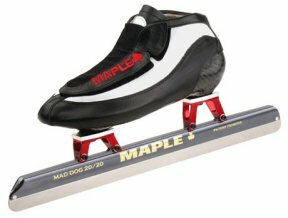 Pictured here is the speed skaters skate. This skate has a drop down blade which olympic speed skaters use today. 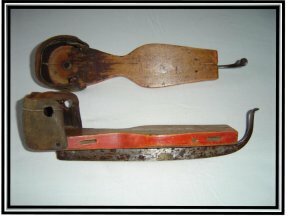 It is called a clap skate as they sound like hands being clapped when working. Because the blade remains on the ice a little longer the skater may increase the pushing power this making more speed. The suit’s the skaters wear are skin tight to decrease the wind resistance. Nothing may be added to the suit to change aerodynamics is allowed. Air resistance accounts for nearly 70% of the resistance to speed skaters, with skate-ice friction making up for the remaining 30%. Scientific studies have found that on curves, a skater is pushed outward by a centrifugal force of 60 kg in the inner lane, 52 kg in the outer. Athletes must counter this force by leaning 45° when in the inner lane and 49° in the outer lane. Olympic speed skating, short track skating had its unofficial Olympic debut in 1932 at Lake Placid, when the American hosts managed to convince the ISU to allow the speed skating events in the North American style of pack racing. Most European teams boycotted, and the style of paired competition resumed at the next Winter Games. Finally short track racing was entered as an olympic speed skating event in the 1992 Olympics in Albertville, France. Olympic short track racing consists of eight different events with the varied lengths. Skaters compete against each other and not against the clock. The races begin with 32 athletes in teams of four in a mass start. They skate counter-clockwise. The winners advance to the next round. There is a lot of strategy during a race as racers slow down and speed up, or wait behind each other in an attempt to gain an advantage to get to the finish line first. It is an exciting olympic speed skating race to watch. Short track relay races are held over two day competitions. Eight teams consisting of four players compete in heats of four with the top teams advancing to the finals. Skating Training Methods. Great site promoting training for speed skating.